Pride month is in full swing & events have been springing forth and happening all over town. This year my alter ego DonnaTella Howe is in fully booked representing Team Diva through Pride. 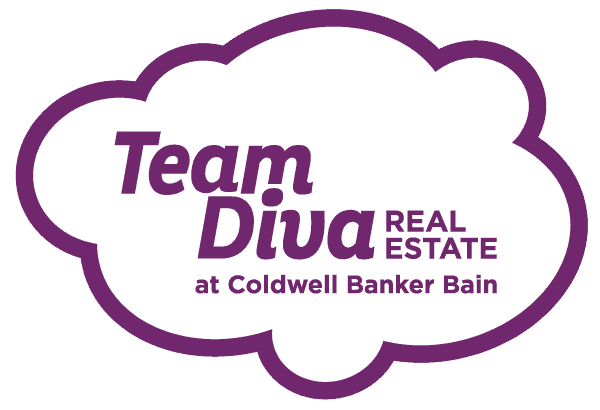 Team Diva put on Divas Take the Hill. 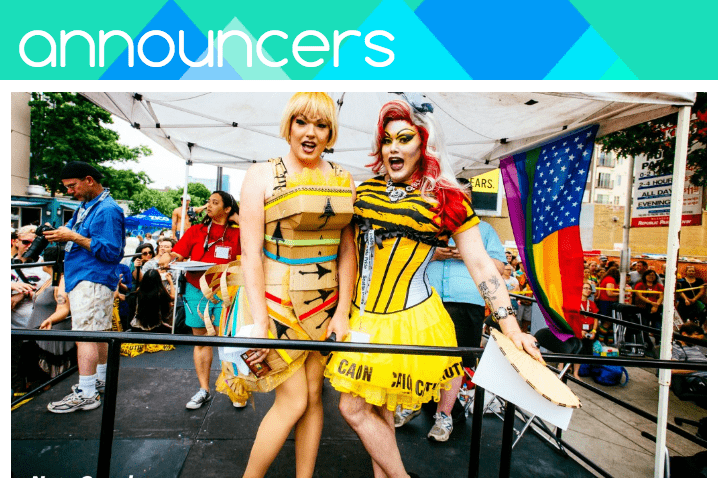 The following Saturday was a 12-hour day of drag as I hosted Seattle Pride’s Volunteer Park Pride Festival harkening back to when the pride parade ended at the park. I even got to do a commercial! Following Volunteer Park, I did my empress duties for Team Diva’s community partner the Imperial Sovereign Court of Seattle at CC Attle’s for fundraising fun with Fireball whisky! The Mr and Miss Fireball pageant pitted those wishing to run for the titles against one another in fundraising via Fireball Jell-O shots and merchandise. Between working in Divaland, for the Imperial Court and Seattle community, it has been a busy year and month thus far, but Seattle Pride week itself is going to be a nonstop marathon of events, fundraisers, smiling and waving. I love every minute of Seattle Pride. I’ve even lovingly nicknamed it ‘Disney princess mode’ with all of the photos we pose for and the fun we bring. Seattle becomes its own pride theme park and here come the list or rides (events) you can check out and of course I hope you do! THURSDAY it all begins (at least for me). If you thought a 12-hour day of drag is long and somewhat crazy well I’m used to it. I’m also used to back to back events which will be happening! First up I will be hosting the Relay Pride Bachelor Auction at The Baltic Room! A night of smoking hot, insanely eligible, gay and straight bachelors, unforgettable memories, and an opportunity to give back to the community. We’ve scoured the hill for the cream of the crop, and they’re ready to woo you with their charming smiles and fabulous date packages! Proceeds will benefit cancer research, advocacy campaigns, patient services, and other life-saving programs funded by the American Cancer Society. Formal attire is encouraged and presale tickets are available! Presale tickets start at $25 – $30 day of at the door! From auctioning bachelors to stand-up comedy! The Sisters of Perpetual Indulgence are presenting ‘Exposed: A Night of Comedy Interrupted by Drag’ Benefitting Baley-Boushay House. What happens when some of the best stand-up comics come head to head with some of the fiercest drag queens of the Pacific Northwest? You will be Exposed to some of the brightest stars of the GLBT Community! Seating is limited in the Jewelbox – get your tickets ahead of time! FRIDAY the parties all over town kick into high gear! Party, party PARTY! Hit up one event or try to hit as many as your heart desires. Its a “choose your own adventure” style night. Gender Blender takes over Neumos a night of dancing and performances from Christeene, Tammie Brown & more! Dickslap Fetish night gives your inner desires a place to dance, drink and play! A local party favorite, it’s surely to be packed, sweaty and a lot of fun. 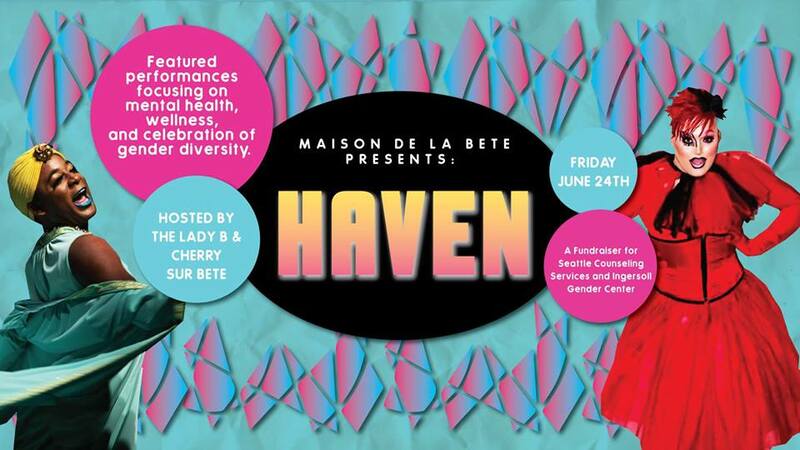 Haven at Kremwerk, presented by Maison de la Bete featuring performances focusing on mental health, wellness, and celebration of gender diversity. If you haven’t checked out Kremwerk yet, it’s a must! Where will I be (for starters)? I’ll be over at Gamma Ray Games / The Raygun Lounge for a special pride installment of DonnaTella Vs Humanity! Get your team and grab your table, the cards start flying at 7:3opm – who knows it might even be back on a new schedule. SATURDAY is that awesome day where Broadway is closed from Roy St south to John/Olive and becomes one giant street party! Julia’s will be holding their Day-of-Drag on their stage outside at Thomas and Broadway (I’ll be performing at 3pm). Doggy Drag Contest at 12pm at the main stage outside QFC! Not just for dogs, last year there was a turtle! Myself, Kara Sutra, Cherry Sur Bete, Siren Hung and Vivien Gabor to see who’s pet is the belle of the ball. Capitol Hill Pride – presented by Delta giving you a taste of what will be happening at Seattle Center on Sunday will be hosted down around the Capitol Hill Light Rail Station. Family Pride and Queer Youth Pride will be going on at Cal Anderson Park throughout the day. HEYO and GLSEN Washington. They’ve teamed two events into one night of revelry for our younger community members. I’ll be co-hosting & performing alongside some of Seattle’s fabulous talent for Gender*Fierce & Youth Pride Dance. Our youth need space to be themselves and celebrate their pride and we are going to give it to them! SUNDAY – THE BIG DAY! The culmination of our pride month here in Seattle. If you hadn’t felt the electricity and love in the air prior, you feel it on parade day! We take over downtown on 4th Avenue with the street packed to the gills with folks from Union all the way North to Denny. Led by the Dykes on Bikes – it’s like one big glamorous pileup that at 11am begins its trek thru our wonderful city. Cherry Sur Bete and I will be hosting at Westlake Center. Miss Kitty Baby and Tru Halliwell at 4th and Bell. Ceasar Hart and Shelita Potroast will be entertaining you at the L Corner Stage. The parade is amazing, I have been on floats and walking it more than I have watching, regardless of where you are with it, you feel how amazing it is. How much love we have in our city and it feels like one gigantic family reunion. The festivities don’t end with the parade – oh no! Ending on Denny means it’s time to head into Seattle Center for more dancing, entertainment and fun with Pride Fest! We literally take over and it is wall to wall pride and it is glorious! If Seattle Center isn’t your thing, Capitol Hill will still be buzzing with parties and goings on. You can wind down however you like with your loved ones and feel the SEATTLE PRIDE all around you. Seattle Pride is just getting started. We kicked off Pride last week with our annual Divas Take the Hill party (recap here). This Saturday you will see the Saturgays and Entourage Bacon Strip. Read Rocky’s personal blog about his take on Seattle Pride. And PLEASE read Kim’s note about how to take action in a post Orlando world.